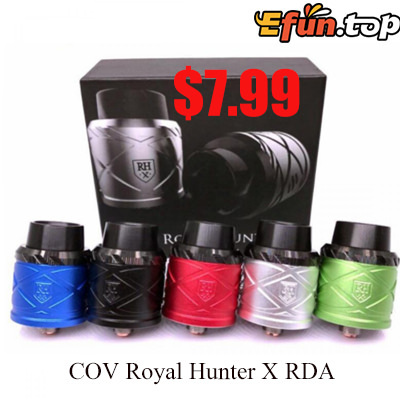 COV Royal Hunter X RDAadopts one of the most innovative build deck designs to date featuring a two-post designs with dual terminals on each post as well as staple clamps mechanism. 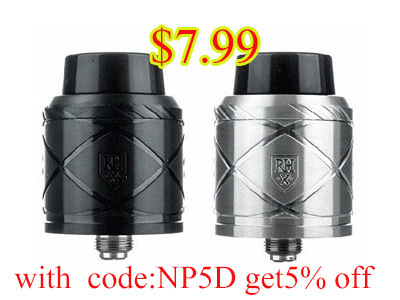 The Royal Hunter X 24mm RDA delivers a crafted sleeve with deep engravings. It also features interchangeable color sleeves. The pioneer achievement lies within the build deck, combining the tried-and-true two-post with dual terminals per post with the integration of staple clamps mechanisms for a truly versatile unit. The result is a wide-space of building chamber with the option of securing coil leads through the four terminal openings, or inserted within the large surface area of the clamp for larger coil structures. Included in each set is an ultra-widebore drip tip for excellent heat resistance and cooling properties when paired with an adjustable airflow system that features three parallel slotted openings on each side.